Office makeovers can be just as big of a job as home makeovers or they can be small and less stressful with just a few changes that will brighten up your space and give it more personality. 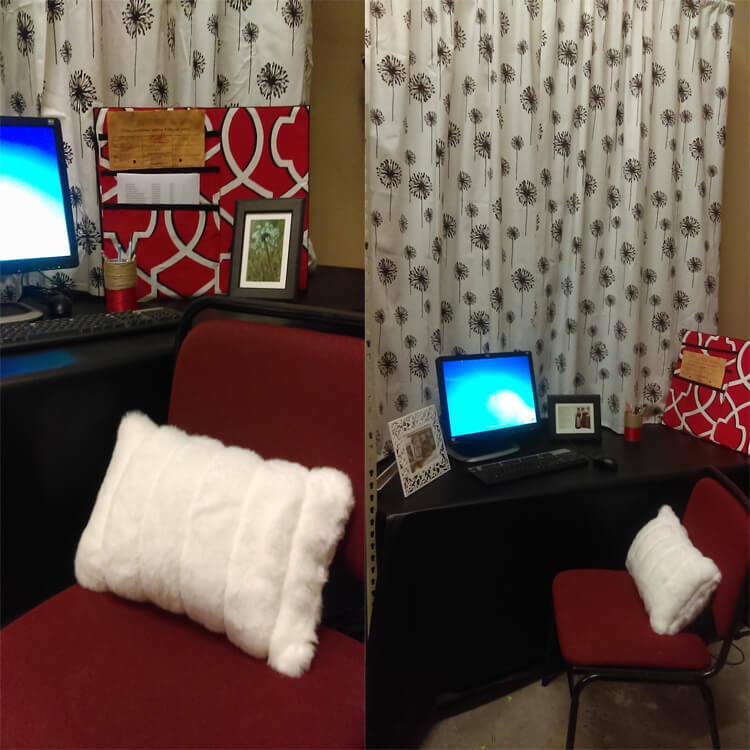 After creating a cubicle makeover here at OFS, we decided to do a office makeover challenge with customers. 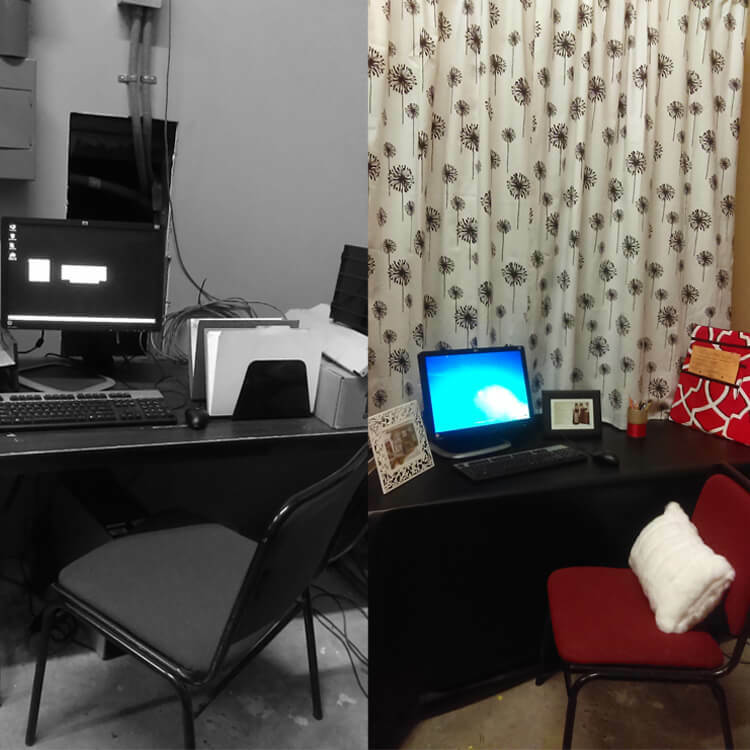 The challenge was to send us a photo of your ugly office space that desperately needed a makeover and we would choose which office needed it the most. 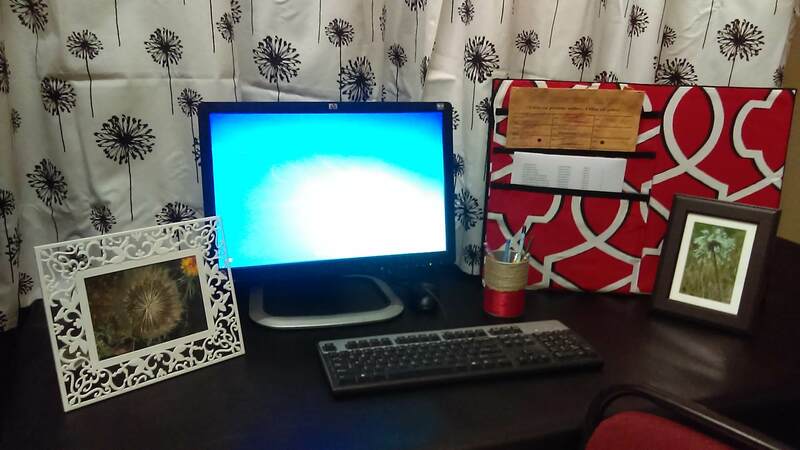 We would then plan out our makeover and create several DIY projects for the winner’s work space and send them to her. 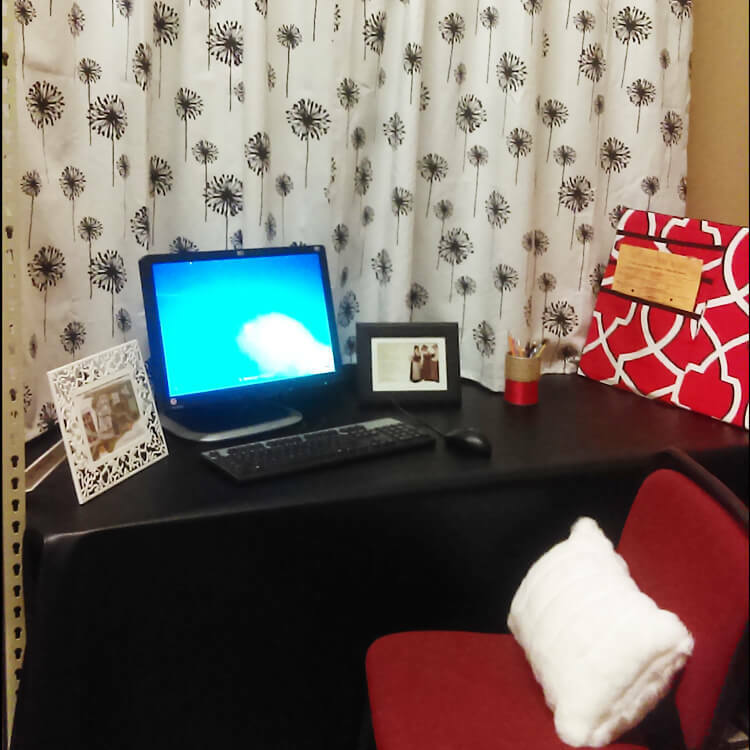 The winner of our office makeover challenge styled her office space and sent us some photos! These projects include: a vinyl table cover, a faux fur pillow, 2 photo frames, a pencil holder, a pocket organizer, and curtains used as a backdrop to cover a wall full of wires and cables. This office makeover is proof that no matter how big or small your space is, there’s always a way to re-model your work space that makes it functional, stylish, and to help bring out your personality. When you think about it, most people spend a lot of time in their work space, so why not make it a space that you love to be in? We used a 10″ x 16″ pillow insert with white mink faux fur fabric for the pillow covering. The vertical stripes in fur give the pillow a textured look with more of a design to it. The chair was already red so we went off of the red chair color for a color scheme and we decided that red, white, and black would look sharp and stylish. The rod pocket curtains are two panels that are hung from a curtain rod on the wall to cover a cable box and wires that stuck out from the wall. The curtains allow easy access to the cable box and wires if needed. We decided to go with a print for these curtains so that the backdrop stood out. The fabric we used for the curtains is Premier Prints Dandelion White/Black Fabric. To cover the table we used 3 yards of Nassimi black vinyl and for the pocket organizer we used Premier Prints Morrow Carmine Red Fabric. This pocket organizer has slots for papers and files and the best part is, is that its versatile. One side of the pocket organizer has Velcro that allows you to remove the cover and use the cork board that is inside. To learn how to make a hanging pocket organizer click here. The pencil holder is a tin can that is wrapped in 3.5 mm natural jute twine and 3/8″ red double face satin ribbon. We found the two gorgeous frames at IKEA and we knew that we wanted them to be totally different but still go with the rest of the decor.